I got some suggestions to try a peanut butter sauce for dinner. So I did a little research and found a couple of recipes that looked good. 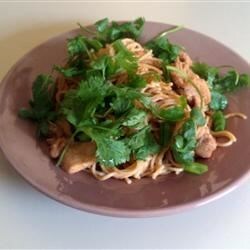 I ended up choosing to modify this Spicy Peanut Chicken recipe because it called for chow mein noodles and I had some I wanted to use up. Doesn't it look yummy? Too bad mine didn't end up looking so pretty. All the comments for this recipe talked about how spicy it was. We tend to prefer less spiciness in our meals so I halved the cayenne and left the chili garlic sauce out entirely. I also used creamy instead of chunky peanut butter because I have to use up creamy. The kids liked it OK but I didn't like it at all. I don't usually care for Thai food or nuts (though I like peanut butter), and this dish was what I expected. DH liked it well enough though and there was so much sauce left over I cooked more noodles and made him some lunches for work. I did not take photos because it really didn't look pretty. Imagine brown spaghetti with some green bits and crunchy chow mein on top. I don't think I'll make it again unless DH requests it.